A new “onestop” border processing where you only visit one office for both countries is in place at Nakonde – almost! Not quite fully up and running yet online as it should be with officials having to get assistance on their cellphones. But a vast improvement, only taking about 90 minutes to get us through instead of 3 hours. The touts and unofficial money changers were making the most of the situation while it lasted. They drove us absolutely crazy and Solveig resorted to her crying trick to get rid of them! Once the system is fully functional the touts should dissapear and that will be the most welcome outcome. Apart from that, it was wonderful to be back in Tanzania with its colourful activity and lovely people. We headed to Utengule Coffee Estate near Mbeya to camp. There we met a young South African lady, Bronwyn McCarthy working at reception, from Jeffery’s Bay. She was missing home and still adjusting to her two year contract in a new country. In Mbeya we struggled to find a supermarket we are accustomed to shopping at, as in the southern countries closer to home. We were only wanting basics fortunately. The rain had not abated on our way to Iringa, so we stopped 50 km short at another favourite, Old Farmhouse, for the night. Luckily we got a site which had a thatched shelter to increased our living space in the rain. In Iringa we just had to visit Nema Crafts again.They give employment to handicapped people, especially the deaf and dumb. When we arrived it was hailing so hard we had to wait in our car until it stopped! Above Nema is a restuarant that specialises in Tanzanian food and drink, also employing the handicapped. Orders had to be written down for the waiters. I couldn’t wait to try a “Rolex”. It can best be discribed as a savoury omelet served in a wrap! We spent the day in Iringa changing our currency into shillings and trawling the street markets. A variety of fresh fruit and vegetables are available and we enjoyed bargaining too. We enjoyed our day in Iringa so much that it was too late to go further so we camped at Riverside camp. In Dodoma there is no camping so we stayed at the Nam Hotel which is about the same price as a campsite. A dreadful breakfast was included. We should have prepared our own too! At least we enjoyed a lovely shower and the car was also washed! We really needed to replenish some of our supplies at a proper grocery and that is why we detoured to Arusha which we had planned to visit on only on our return journey. We spent a few days at Meserani Snake Park. It was so good to see Ma and BJ again. They’re the owners and ex South Africans. Unfortunately we learnt of the sad news that BJ is not well. Meserani is one of those places that you will always meet interesting fellow travellers and this time was no exception either. Tremaine, an Australian Maths teacher was there to climb Kilimanjaro before visiting family in South Africa and was driving a Bushlore HiLux. We don’t usually get on well with Australian ex South Africans but Tremaine was an exception. He (61) and Ben(49), a separate traveller from the Canary Islands got on so well with us even though we were old enough, 72 and 69, to be Ben’s parents! Ben owns a Kite Surfing resort in the Canaries. ” Ma” you’re both so special. So sad to say goodbye once again! We had toyed with the idea of visiting Tarengire Game Reserve but the prohibitively expensive entrance fee of US $150 for foreign vehicles on top of all the other charges put an end to that. A proud Masai in traditional clothing and shoes! We had left Arusha later than planned and never reached our overnight destination so even wild camped at a filling station like we did in South America. Wild camping. … South American style! The road was good the first day but deteriorated the closer to the border we came. Why is it? This happens in most countries, even back home! We stayed at the Old German Boma on our second night. Most overlanders do. It required a detour of about 35 kms. We met an Englishman, Jonathan on a 200cc Suzuki staying there too. He was going the opposite direction to us. We invited him to breakfast and he confirmed many places we weren’t sure of visiting. Very reassuring! We’ve been so lucky with the wonderful people we meet. Just as we had expected, the remaining section of road to the border was the worst! The good news was that the Ruvumu border was also “onestop”. But this one worked and was a pleasure! In no time at all we had crossed into Rwanda. Now to get used to driving a right hand drive vehicle in a country that drives on the right side of the road!! Our border crossing at Katimo Mulilo / Sesheke took a long time even though we used a Carnet. As we exited the border we were stopped to pay a further tax! This time a municipal levy. We are convinced it was just another rip off. Last time we’d been on the road between Sesheke and Kazangula we decided it was the worst road on our 2014 trip. We’d expected that by now it had been repaired, or at least patched up, but no way. Hard to imagine, but it was far worse!!! The region had received a lot of rainfall and many of the rural dwellings and villages were partially flooded too. Lakes formed along the roadsides as we had seen near Gweta in Botswana. Ages later, exhausted, we arrived in Livingstone in urgent need of a drink. We went to book in at the Waterfront as usual but found the fees had increased substantially. Zambia, a dollar based economy, and the Rand’s depreciation, didn’t help either. Scott and Helene Cable, who we’d met in 2014, had recently blogged that they had stayed at Maramba Camp, so we gave it a try. $20 per site was acceptable. The staff at Maramba were wonderful and welcomed us like old friends when we mentioned the Cables. They even directed us to camp H, their site, alongside the river. That evening we were glad to have had the thatched lapa for additional shelter as there was another fierce thunderstorm! Hippos kept us company in the river alongside that night. We stayed there a few nights while visiting all our favourite places in Livingstone. Fortunately it hadn’t changed much and we enjoyed being back in one of our favourite Zambian towns. On our way to Lusaka it rained most of the way and we stopped for the night at a sodden Moorings campsite. We met a German couple with an ex-Dakar support vehicle which they had purchased and fitted out as a motorhome. They had intended to visit Mozambique after Malawi but had to re-route to Zambia because of the heavy flooding in the Zambezi delta region in Mozambique. Everywhere we’d been was experiencing much more rainfall than usual, except the Western Cape! We passed through many small villages with roadside vendors and their beautifully displayed vegetables, and the inevitable bags of charcoal too. Luckily Zambia has very dense forests and the impact hasn’t been too obvious on the trees. Zambia’s large rural population has no other source of power to live by. By contrast, she is not begging but giving us a smile! We arrived in Lusaka, greatful that the road between Kafue and Lusaka had been completed since our previous visit. We chilled with Ginty and Kate on the weekend and caught up with some communications too. On Monday Ginty assisted me in arranging for a car service with his trusty mechanic, Dan, who happens to specialise in Cruisers. At this point I should mention that Zambia is real Cruiser country. So many vehicles we’d seen on the road are the same as mine. I was very happy on arriving at Dan’s, his yard had a number of Toyotas in varioaus stages of repair. The service turned out to be more than a service! Before leaving home we had the car prepared for the journey which included replacing the very noisy rear brakes. The noise had returned. The cause was found to be a leaking oil seal at the rear diff which had saturated the brake linings. Both the linings and oil seal had to be replaced. While performing the repairs two of the wheel bearings were found to be in need of replacement too. One had collapsed and another had nearly seized. (standard grease had been used instead of high temperature). As a safety measure all four were replaced. Enough said!! We made arrangement to meet Scott and Helene at Eureka campsite right next door to Ginty and Kate. We spent a wonderful afternoon with Scott and Helene at Eureka swopping stories since we last met at Jungle Junction in Nairobi. They also gave us valuable information regarding our journey. We look forward to seeing them on our return in South Africa. We enjoyed our stay with Ginty and Kate. We don’t get to see enough of them these days. Ginty and I, in spite of being family, have been friends since the fifties! We spent wonderful evenings reminiscing about the old days!! All to soon we said our goodbyes we were off again. We took Ginty’s advice and stopped at Trotters on the Great North Road for a coffee. We found a craft shop there; Lime ‘n Thyme, with some really great creations made by the owner, Debbie. Solveig got on so well with Debbie that we were invited to stay at their farm nearby. We accepted provided we could still stay in Twiga Penthouse and not inconvenience them at all! We cannot believe the generosity and friendliness of people we meet on our travels. Debbie insisted that we join them for supper too! We hope to reciprocate one day. The next morning Adam gave us a guided tour of the farm. We were very impressed! Adam farms Virginia Tobacco, Maize, Soy, Cattle, Ground nuts and is experimenting in Passion fruit and Sunflower seed. We visited the tobacco grading, and the curing process which took place in heat and humidity controlled container sheds. What a treat! As a parting gift they gave us a shopping bag full of lovely avos from beneath a tree. We are still enjoying them with our evening meals. After the late start we stopped at Fringellas for coffee and meat pies. Not nearly as tasty as Peregrines in Grabouw but never the less a lovely stop. We got as far as Forest Inn on the Great North Road. There we met two South Africans. They were involved in farming chemicals and working in the area. One of them was investigating the possibility of running the Zambian office. 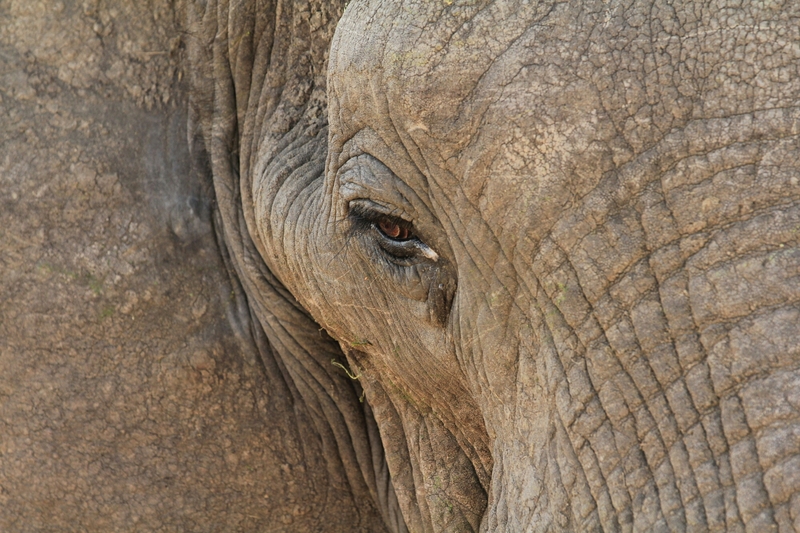 We had a look at Kasanka Game Reserve, known for its Sitatungas and the massive bat migration in October and November. 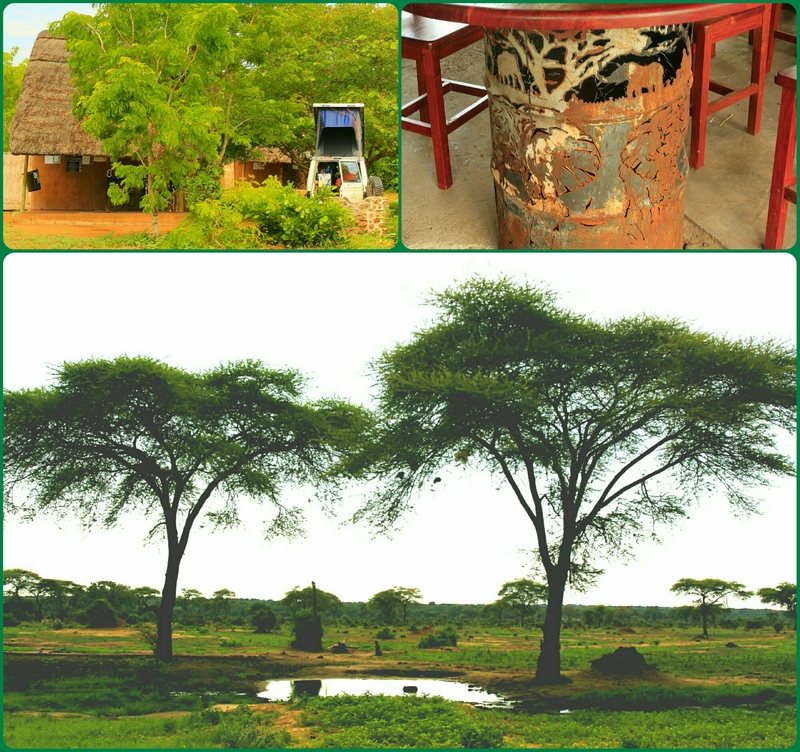 But Kasanka was too expensive for just an overnight stay, so we continued to Kundalila Waterfall and stayed at the community campsite. Danny Boy , who runs the community campsite, with me across the river! We were still experiencing the almost continous rainfall we’d had during our entire stay in Zambia and carried on towards the border instead of staying at Kapishya Hot Springs. Luckily we found a guesthouse at Isoka where we were able to camp near to the border at Nakonde. Not too far to the Tanzanian border the next morning. The rain seems to have subsided too…… But too late for this unfortunate truck! We just can’t keep away from N’Gepi! The Kavango river was a metre higher than last time and there was plenty of rain about too, but we still enjoyed chilling in our favourite campsite with the hippos. It was great to meet Mark’s son Rob at N’gepi having missed Mark by about two weeks. Wearing a crown on the Royal Throne! On our way Katimo Mulilo we detoured at Kavango to try out the recently tarred road via the Mudumu Game Reserve. This route was about 60 kilometers longer to Katimo Mulilo but so much more interesting and very good tar! 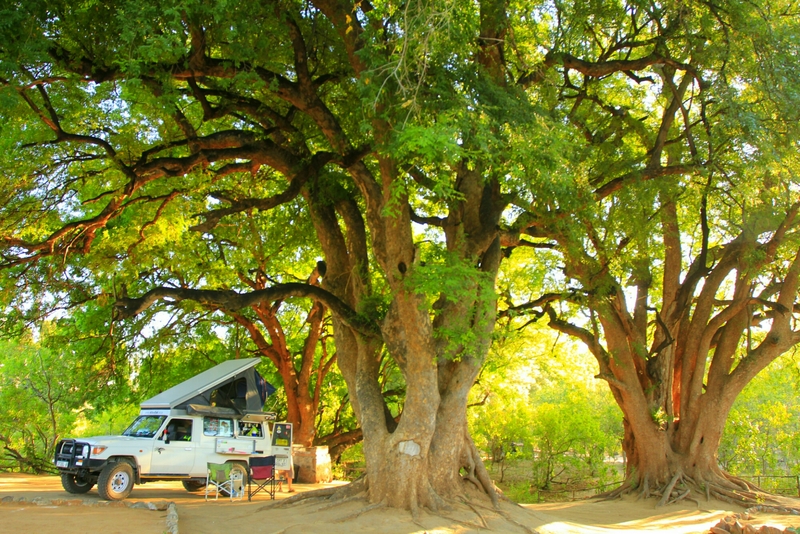 We elected to stay at the Protea Hotel campsite in Katimo Mulilo, well situated alongside the Zambezi and close to town. The campsite comes with free WiFi, electricity, and clean ablutions with hot water. After some shopping in town we returned to our camp to enjoy the sunset . Early the following morning we left for Livingstone in Zambia and wondered about the condition of the road from the border at Sesheke. The previous time was dreadful! We withdrew some Pula from an ATM and filled up with diesel at 7.26 Pula per litre (about R9.30) What a pleasure! We were told that Jill had closed Berry Bush farm where we stayed last tIme. She had not been well. The first 60 kilometers of the route to Mabuasehube was on good gravel that had recently been graded and we made good time. Then we hit the sand! It was as if everybody that had gone this way before had made their own track. It was a mess! Our Landcruiser took it in its stride and we managed a steady 40 kph in 3rd gear high range. There was a bit of confusion when we booked in at the gate, the head office was offline. We could stay where we liked and sort it out on departure. We were so lucky with our timing…The pan was filled with water. A rare event! We headed for campsite #1 where I thought we were booked, but it was occupied by a couple, Charles and Emma, who were leaving the next day. We returned to site #4 which was vacant and set up there. It was in a beautiful position on top of a hill overlooking the pan. Equipped with a drop toilet, no water, no shower, an A- frame shelter, fire pit and plenty of trees. There were a number of small creatures that had taken up permanent residence here. Later that day we drove over to camp #1 on a cliffside overlooking the pan. We decided to camp right on the edge instead of in the campsite as there were no facilities there either and it lacked the spectacular view. George came with us this time too! On our last day we could already see the water in the pan was receding and these Gemsbok had no difficulty crossing. Our route out took us back on the same road to Tsabong as recommended by the officials at the gate. It was a long days drive to Kang Ultra where we enjoyed wonderful hot showers for the first time in 4 days but our stay at Mabuasehube was really worthwhile. Between Kang and Ghanzi the road had many cows, goats, donkeys and horses. There is also a lot of heavy traffic on the Trans Kalahari highway and unfortunately this horse was probably killed by a truck. We had another long days drive to Maun which was taxing not only because of the animals in the road, but also dodging the potholes! Carol had given us this teacloth with these meaningful words as seen in this photo and Solveig turned the cloth into a much needed apron. While in Maun we visited Birgit and Reiner who have supplied our shop for many years with cloth used in jackets. They make regular trips to West Africa and Central Africa to purchase African treasures. Always good to see them and visit their stunning home. Our next night was spent at the iconic restcamp, Audi Camp. We could never come this far and into this region without a visit to N’Gepi. Even though it was in the Zambezi region in Namibia it was worth the detour. We left Maun and took the route on the western side of the Okavango swamp once again. 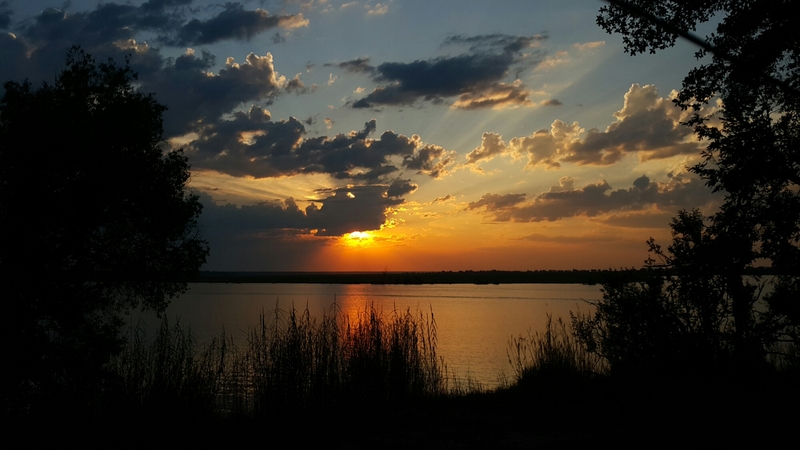 This time we decided to try a different campsite and chose Drotsky Camp on the banks of the Okavango River. Words are hard to find to describe the serenity and beauty of this place secluded under huge trees covered in vines. We awoke to idyllic weather following a day of thunderstorms with everything fresh. We’d slept at Springbok Pan Guest Farm in the Bateleur Campsite a few kilometers from McCathy’s Rest Border post. Green grass and beautiful yellow flowers everywhere. 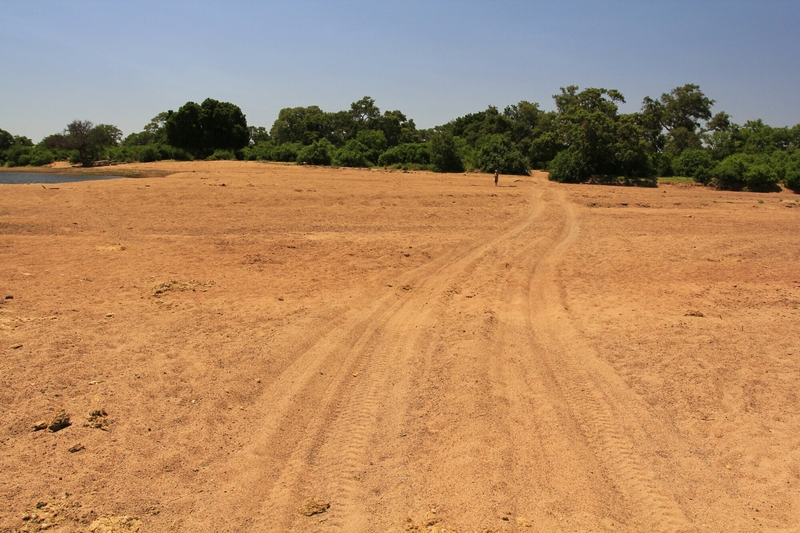 This whole region, normally an arid, dry part of the Kalahari, had been transformed. The rains had performed their magic! A week before on Saturday 7th January we started our journey at last! Our first nights stay was in Plettenberg Bay to say farewell to my sister Carol and David. We’d not seen their new home yet and also had a “limited edition” calendar as a gift for them. Carol had arranged a wonderful send off for us by inviting family and friends over for the evening. Despite roadsigns to the contrary, we were able to detour on the old road through beautiful Natures Valley and the Groot River pass, as well as the Blaaukrantz pass, with its huge trees covered with old man’s beard and “Tarzan ropes “, rejoining the N2 at Coldstream. Thus bypassing the Toll road! Our first night of actual camping was in Jeffery’s Bay, virtually right on the beach at one of our favourite places. We needed to check that we had made adequate preparations to our camping setup and vehicle. The caravan park was still charging holiday rates unfortunately. To add to our dissapointment, the weather was stormy too. Our vehicle passed our final check and we left the next day for Camdeboo Game Reserve in Graaff Reinet at the Valley of Desolation. A lovely campsite in the bush but with very little game. The main attraction, The Valley of Desolation, didn’t let us down. After seeing the dam level and being told that the Sunday’s river had not run for 4 years we forgave the heavy rains that dampened our stay there. It was summer and we expected lots more rain before the end of our travels. We were adequately prepared for all types of weather. After a nights stay in the town at the Urquhart campsite and a night in Kimberley at the Big Hole campsite, I must comment about some municipal camping facilities. Both campsites are run by their respective municitalities and in both instances, the electricity supply was faulty. NO EARTH ! Extremely dangerous to campers prepping their food in damp grass! To overcome the danger I took emergency steps! Before reaching Kimberley we detoured to view the Solar Power Station at De Aar. Very impressive! From unconfirmed information we received it is said to be the largest installation of this type in the Southern Hemisphere. We drove alongside it for about 4 kilometers! After another night on the road in Kuruman we did some last minute shopping and our journey began for real!! South Africa is such a popular foreign tourist destination we are allocating time this year to find out what we’ve overlooked here at home. We’re so often ready to explore destinations in other countrie before right here on our doorstep. SAN Parks undoubtedly does the best job of running one of the most outstanding nature destinations in Africa. They offer such good value for money too. The rest of the country has such a diversity of everything a tourist wants. From its People, to its Mountainous areas, Arid regions, Sub tropical, Savannah and Mediterranean climatic zones. Not to mention it’s coastline of over 3000 kilometers flanked by two oceans. It’s literally a world in one country. We re-entered South Africa at the Pont Drift border, through an absolutely dry, sandy Limpopo river and we headed for Louis Trichardt. Solveig walked across! Sven and Anka crossed here before when they rode their bikes through Mashatu on a cycling safari. They used this cable car to cross the then flowing river. You can see that the river in the background is dry. Our plan was to traverse the northern part of the country from west to east, in the Limpopo province, which is so far from home we seldom venture there. We enjoyed the mountain scenery in contrast to the almost flat landscape in Botswama as we travelled along the beautiful Soutpansberg range to Louis Trichard. After stocking up with provisions we headed north once again through the stunning Wyllie’s Poort with its lush forests of huge indigenous trees. That night we camped at Tshipise. A hot spring resort we’d often heard about but never visited. A huge change from the wild camps that we are accustomed, but after all, we were exploring what was on offer in our country! The resort’s beautifully appointed with everything just perfect. The hot springs very relaxing too. The place wasn’t busy, we were grateful it wasn’t the July holidays, their peak season, as there are more than 300 sites! The altitude dropped as we left the escarpement before reaching Pafuri in the Northern region of the Kruger Park where the air was thick and hot. The Shingwedzi river was another big surprise. It wasn’t flowing either! The drought had left only patches of water here and there! On our previous visit here with Dukken and Rolf it was flooding its banks. Wherever water was to be found, it was crowded with animals quenching their thirst. The Kanniedood dam was empty too. The harsh conditions were favourable to game viewing with the sparce vegetation a bonus for visitors, but unfortunate for the animals. Nevertheless it was wonderful to be back at Kruger and we enjoyed five nights at various camps. Before continuing our homeward journey we detoured via Gauteng for a week! Visiting Eli and Shirley, family we hadn’t seen for ages. Dear friends, Noleen who once worked with us, as well as Yvonne and Boet, who live in Denokeng on a game farm! A week caught up in the rush of the Big City once again, with its trendy markets and eateries also made for a wonderful break. We still had time to kill while our home was being rented with nowhere to go. Back to Swaziland for a few days. On the way we stopped over in Chrisiesmeer for coffee and to find a place to camp for the night.There we met Andrew Rathbone, the owner of the shop, so friendly that we ended up parking around the back of his place for the night! We’ve met the nicest and friendliest people wherever we’ve been. We’re so lucky, absolutely everywhere! Botswana is so special you can’t keep us away. 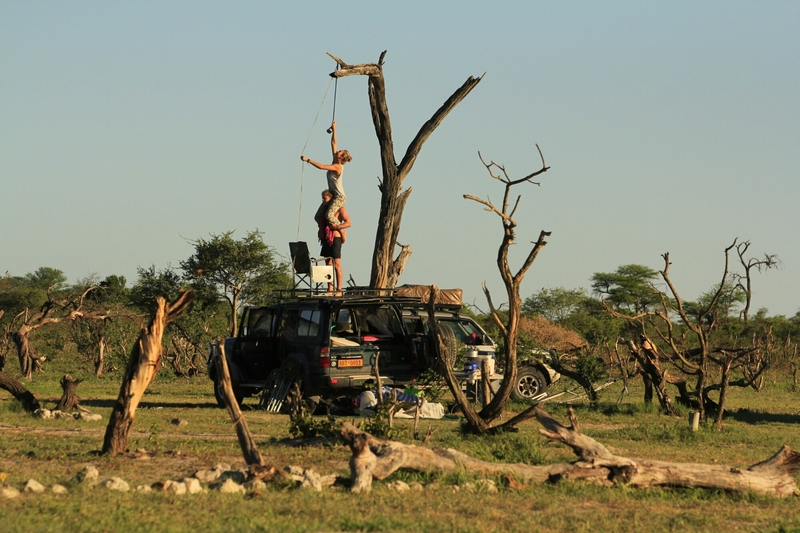 After New Year in the Caprivi we returned to Botswana. This time to the Chobe area. 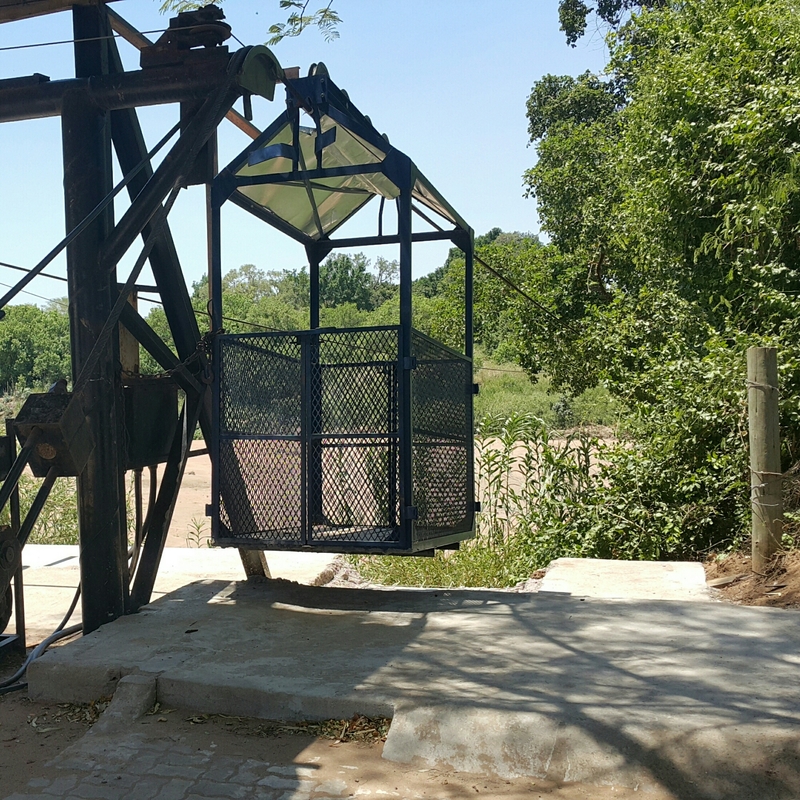 We could not believe that at the Ngoma Bridge border the Chobe was not flowing at all. About 18 months earlier we had difficulty getting to Chobe Lodge, where Max was working, due to flooding. He had to guide us to the lodge using a special route. 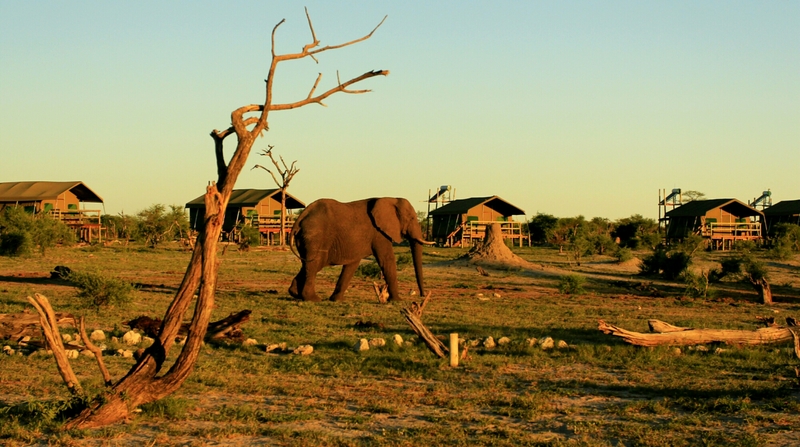 Our second shock came when we could not get a campsite at The Chobe Safari lodge. It was full! So were other campsitea we tried in Kasane. 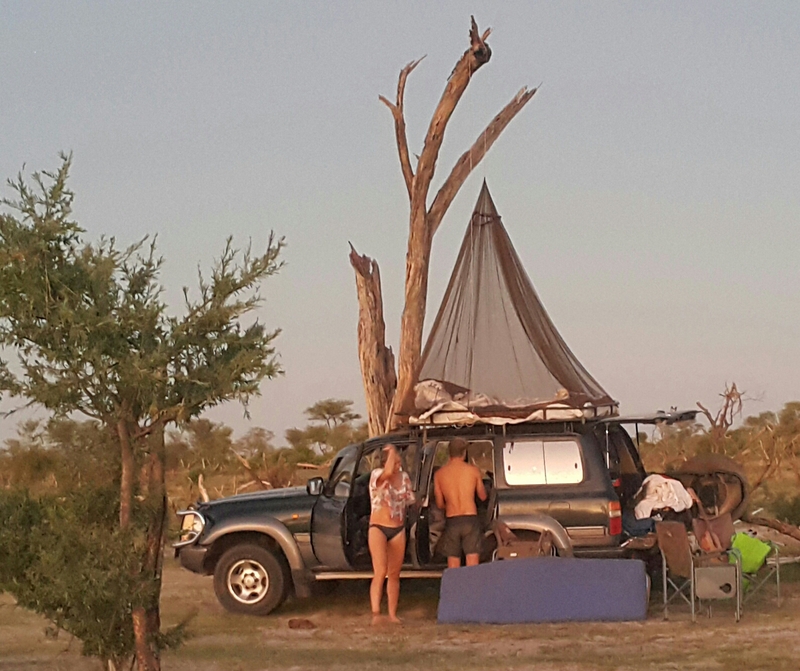 Fortunately we’d been told of an amazing campsite near Kasangula on the Hunter’s road; The Senyati Safari Camp. Luck was once again on our side. We got a site with private ablutions and a covered stoep. The real bonus was to come that evening after sunset. 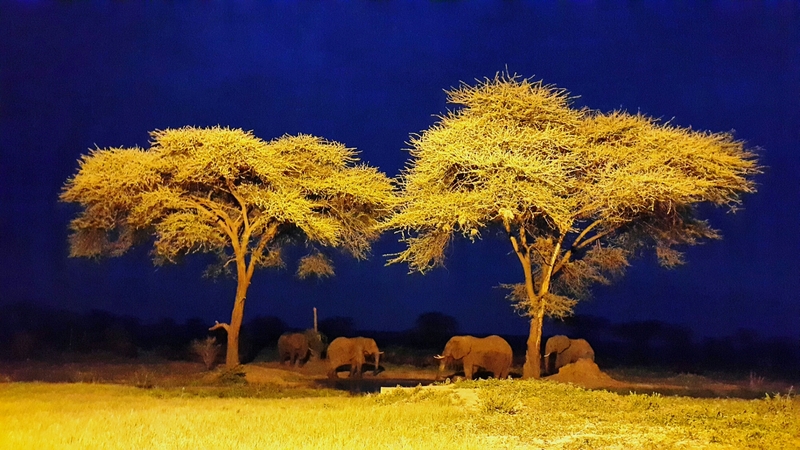 Senyati’s floodlight waterhole. We had so looked forward to staying at the Chobe Safari Lodge campsite that we decided to return to Kasane and have another attempt. 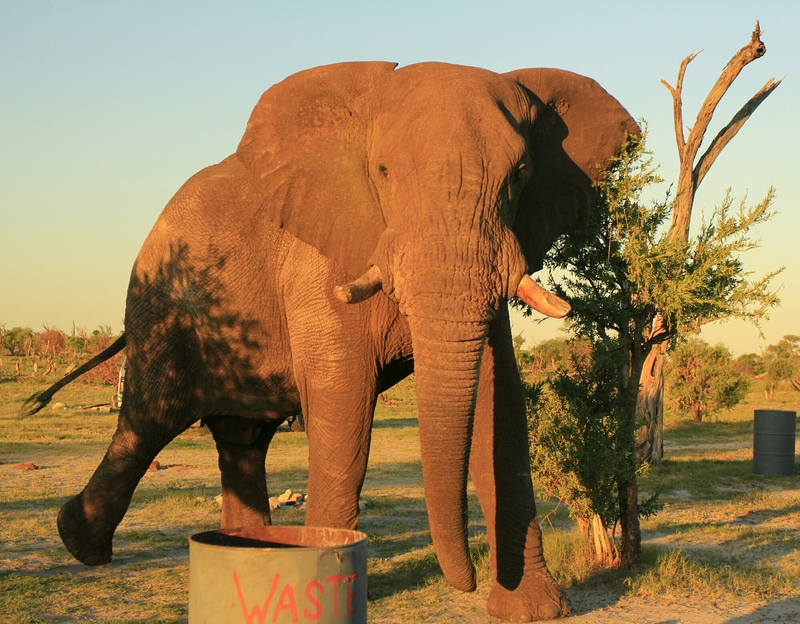 Senyati is located almost on the Hunter’s Road, which runs along the border between Botswana and Zimbabwe. We choose this route to return to the Kasangula border post. What a treat! We saw lots of game and we felt quite a rush too as we probably strayed over the border at times. There was no problem getting a campsite this time. We got the one alongside where we’d stayed with Keith and Tickey. Our journey continued a few days later southwards to Elephant Sands. We made an attempt to travel along the Hunter’s Road but gave up not wanting to risk it alone. There were patches of sticky cotton soil mud on the route and we might have got stuck if we’d continued. We had enjoyed being on our own but this was one of those occasions we needed someboby as backup. For those of you that have never been to Elephant Sands you might have heard that it’s a bit like being in large zoo. The animals are so dependant on the waterhole that they just have to visit. But what makes it real is the fact that there are no fences and the animals walk right amongst the campers. Unfortunately it’s difficult to exclude the chalets from the photos. We were amazed at the inovation of some people…..using a mosquito net instead of a tent! So much more comfortable in the heat. But it’s not easy to take down afterwards. A really worthwhile stopover on our penultimate night in Botswana. 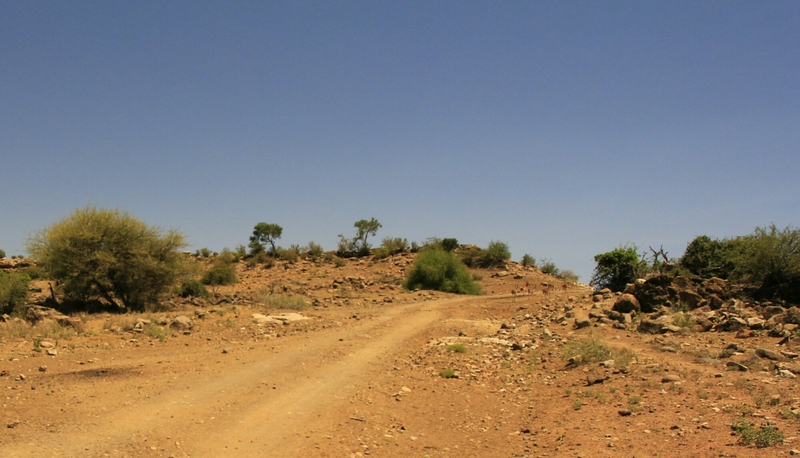 What lay ahead was a long drive to the Tuli Block. We’d been advised by other travellers that it was possible to cross the Limpopo this year because of the drought. The river was not flowing! This occurs sometimes during winter but seldom in summer. The so called rainy season! 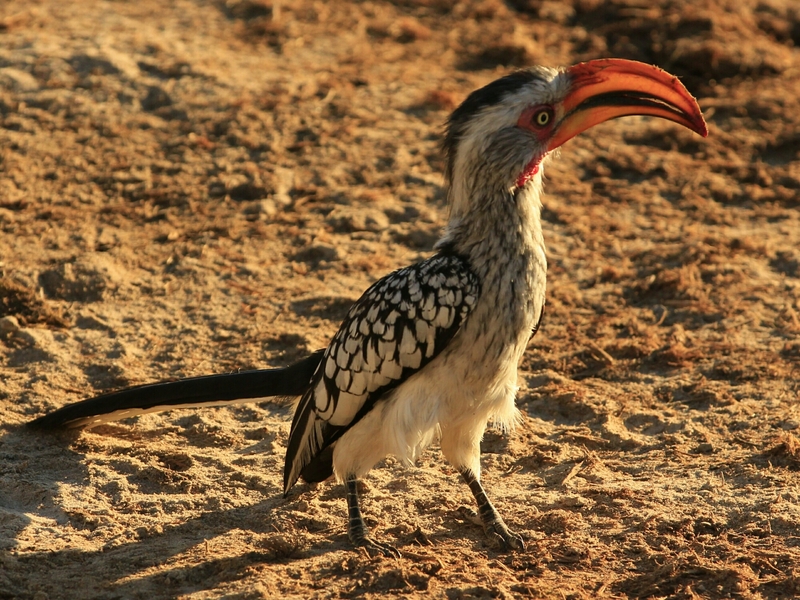 We’d never been to the Tuli before due to its location in an out of the way corner of Botswana. It’s a fairly mountainous region which makes it very beautiful and different to the plains and pans we were familiar with. In fact, similar to the Motopos in Zimbabwe across the border. 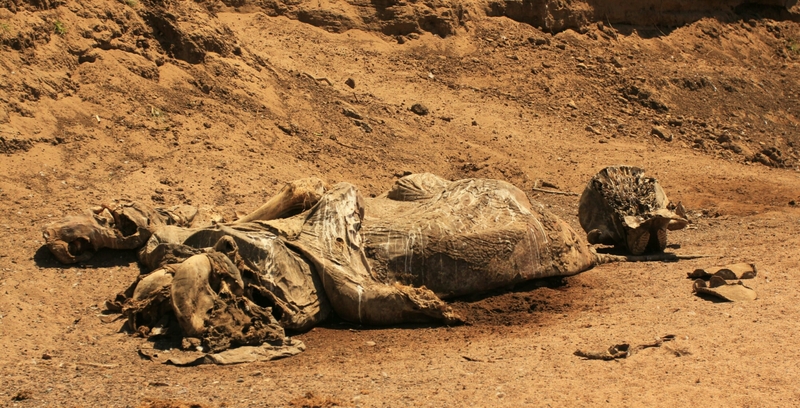 We came across this Elephant carcass in a dry river bed at the boundary of Motswari. Our campsite right next to the Limpopo under these huge Nyala Berry trees. Look carefully and you’ll see Solveig walking across the Limpopo River! After a very hot, dry and wonderful six weeks we were back in South Africa where our journey continues. …..
iansolveig's Blog Blog at WordPress.com.